‘Kurdish peoples across four Middle Eastern countries have been striving for self-determination and democracy for many years,’ said Dee Searle (candidate for Tottenham), who came into direct contact with Kurdish human rights activists during her years working for Amnesty International. ‘Their bravery and determination left a lasting impression.’ David Flint (candidate for Enfield North), who visited Kurdish areas in Turkey last year, spoke of his positive experiences of Kurdish society. 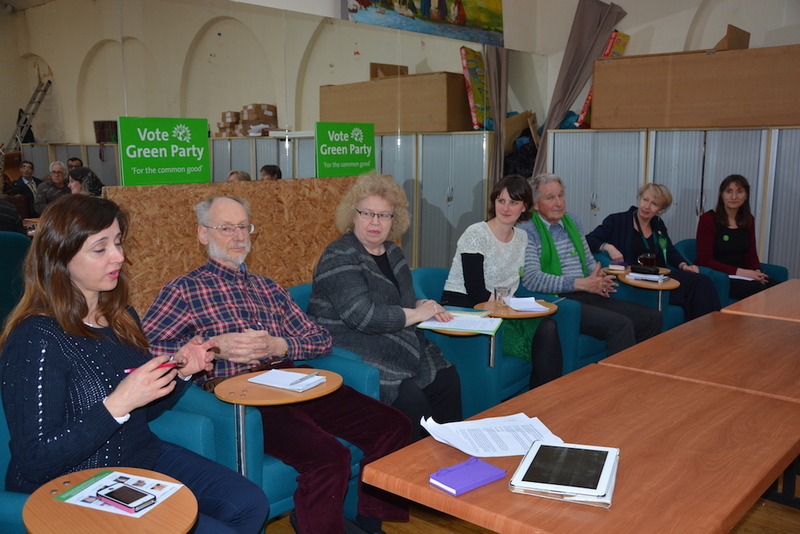 The meeting, held at the Kurdish Community Centre in Portland Gardens in Harringay last Thursday (2 April), was arranged to discuss Green Party policies for the General Election. High on the agenda was the threat from Islamic State militants to the autonomous canton of Kobane in northern Syria, where around 100 Western volunteers – including some Britons – are fighting as part of the 30,000-strong Kurdish forces. Members of the audience asked for international military and humanitarian aid to help Kobane’s residents defend themselves from Islamic State and to rebuild areas that were destroyed by the US-led bombardment that helped to drive out the militants. Gordon Peters (candidate for Hornsey and Wood Green) applauded the Kurds’ resistance against Islamic State, saying that he admired the people of Kobane for their participative democracy with a commitment to preserving the environment. Jean Lambert paid tribute to the society of Rojava, the Kurdish Syrian region, for its emphasis on women’s equality. Heather Finlay (candidate for Hackney North and Stoke Newington) recalled collaborating locally with members of the Kurdish community to protect health services. Caroline Russell (candidate for Islington North) described working with Kurdish people and other community members on local traffic issues. Representatives of the Kurdish Community Centre said their existence was under threat because the UK Charities Commission frequently accused them – erroneously – of political activities which contravene charity laws. Charlotte George (candidate for Hackney South and Shoreditch) said this was unfair and that the Charities Commission needs to do more to address genuinely bogus charities. Green Party policies to introduce a living wage of £10 an hour by 2020, create good jobs, ensure fair rents and secure tenancies in private rented accommodation, build council homes, preserve the NHS and other public services, and tackle climate change were warmly received by the meeting. ‘Many Kurdish people support Green policies’, said Michelle Allison.